The Haunting – Robert Wise -1963 – Great film! Each deals with the same story. Which is better? The old adage is that the book is always better than the movie. Quite often this is true -but never always. Tolkien fans will want to hang me out to dry for writing this, but I enjoyed Peter Jackson’s Lord of the Ring’s films more than Tolkien’s books (Hobbit films not included). On the other hand, I thought JK Rowling’s Harry Potter series were far better than the films. So for me, it just depends. 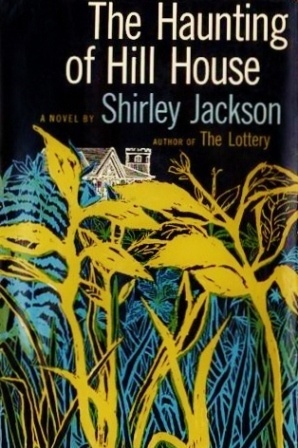 About a week ago, I watched The Haunting again (saw it once about fifteen years ago) and reread The Haunting of Hill House – the book by Shirley Jackson that inspired the movie. Before going into the whys and wherefores of any possible preference for one over the other, let me address some possible confusion concerning these titles and another film of a similar name. 1950s – It was the decade of “Haunts” and “Hills”. 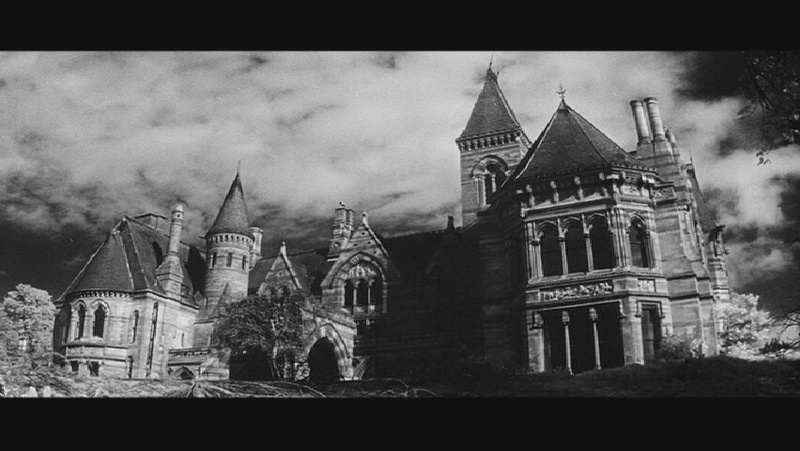 Shirley Jackson’s The Haunting of Hill House novel came out in 1953, and William Castle’s film The House on Haunted Hill premiered in 1959 (click here for my review of this film.) Please note – these stories have nothing to do with each other. Castle’s movie is NOT Jackson’s book adapted for film. The film version of Jackson’s novel is simply called The Haunting. It came out in 1963. Castle’s film has the word “Hill” in the title, just like the Jackson’s book. Right. Well, it’s a about this house, see? And it has a history of death and violence associated with it. Dr. Montague is a professor of anthropology who wants to embark upon a scientific study of paranormal phenomena. So he rents out Hill House and invites three other people to live in the house with him and together they are to study any ghostly activities that might occur. The tale focuses on house guest Eleanor Lance. She is the unreliable narrator, freed from a decade long burden of caring for her recently deceased invalid mother. She is quite neurotic and not prepared for the ghostly disturbances that Hill House will bring. Or maybe, in her own twisted way, she is very much ready for Hill House. Too prepared for her own good. I will expand on this later. As to the book’s faults, the dialogue and plot sequences are sometimes disjointed. Eleanor and Theodora are at each others throats at the end of one chapter, only to be locked arm-in-arm in friendship at the beginning of the next. The group as a whole will suffer through a horrifying haunted house experience, only to be laughing in camaraderie shortly thereafter as if they were vacationing at a spa. And yet, I understand this laxity of flow. The neurotic and insecure Eleanor is the central character and the story is unveiled through her unreliable thought processes. But in the end, both platforms excel at establishing a mood and setting necessary to bring this haunting tale to life. The book does so with its poetic descriptions, tone and character development while the film captures the chilling mood with skillful camera work and brilliant art direction. The question then becomes – which of these modes of artistry better instills a fond sense for the chilling? For me, it’s a tie. Who or what is the “whatever” that walks alone? In the end, maybe its Eleanor? Maybe. The book traces the haunting developments of Hill House from her skewed perspective and it does it well. It’s almost as if Eleanor herself is the ghost. From the beginning, Eleanor, trapped in arrested development on account of her being forced to care for her invalid mother for many years, yearns for a life of her own. Ghosts to that, don’t they? Little by little, the house takes her over. She insists that she belongs at Hill House. And maybe she does? Haunted houses need their ghosts. Toward the book’s end, she watches the rest of the occupants from afar; detached. Sometimes she is hiding on them – spying. Is she the topic of the conversation Luke and Theodora are having? No. So she moves on. Eavesdropping. She has the attention of no one. She belongs not with them. Only with the house. And the house will have her at the end. The film follows the slow dissolution of Eleanor as well, but to a lesser extent. Due to the limitations build into the film medium, it cannot develop the character as well as the book. Instead, it does what it can with the tools it has. It focuses a lot of attention to the house itself. And this focus is done artfully. The establishing shots show the house in its totality. Slowly the contrast fades and the house dissolves into a dark, amorphous shape. Dutch angle camera techniques are used to give viewers a disoriented perspective of the innards of the house. 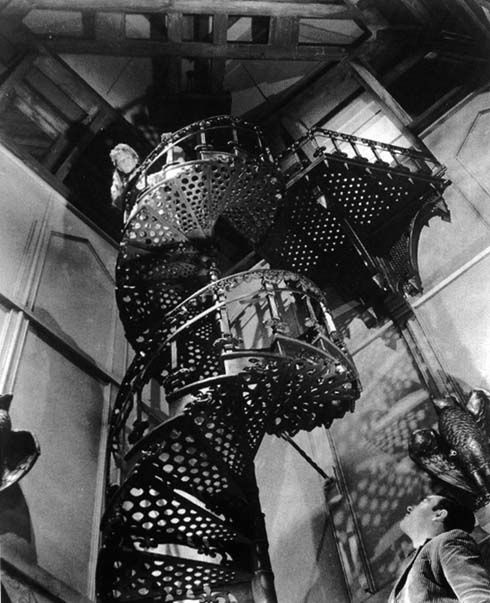 The camera shakes when the characters climb a rickety staircase. Then there are the props – the film is generous with haunted house décor. There are the wooden faces of children carved into the corners of the nursery door (creepy! ), the giant statues of a saint healing lepers (mysterious!) the wallpaper of chaotic designs (unnerving!) and the enormous bedroom doors that seem to have an eerie face hidden in the etching-design. Then there are the sound effects – the disembodied laughter, the whispering, and, of course “The booms”. BOOM! BOOM! BOOM – as the ladies hold each other in fright – something is pounding on their chamber door! In his book Danse Macabre (1981), a non-fiction review of the horror genre, lists The Haunting of Hill House as one of the finest horror novels of the late 20th century and provides a lengthy review. Maybe someone else can choose one over the other, but I cannot. I highly recommend both the book and the film. Thank you for reading this article. If you enjoy my writing, please consider buying my latest book. A writer/house sitter haunts a house with his stories. They haunt him back in return. Actually, a point I was trying to make is that for me, a book is “not always” better than the movie. In fact, when I began writing this review, I had the movie pegged as the better of the two. But I changed my mind as I reread the book and decided they were both equally good. But you’re right, a book is usually better than the movie. Thank you for your comment, and thank you for reading my blog!